This Blueberry Strata is a great, hearty dish, also known as Blueberry Cheese Strata, is perfect for cold mornings, and it’s a make ahead dish that can be made the night before, refrigerated overnight, and baked in the morning, a great time saver! The blueberries in the strata, and the syrup, can be changed to any fruit you would like, such as raspberries, peaches, or strawberries, for example. The syrup is also delicious served over crepes, or ice cream. FOR STRATA: Grease a 9"x13" baking dish with non-stick cooking spray. Place two-thirds of the bread pieces in the dish. Cut cream cheese into small pieces and sprinkle over bread. Sprinkle with blueberries. Top with remaining bread pieces. In a large bowl beat the remaining ingredients and pour over the bread. Cover with foil and refrigerate overnight. It can also be frozen at this point as well. Thaw in refrigerator for 24 hours prior to baking if frozen. In the morning, remove from fridge and allow to set at room temperature for at least 30 minutes before cooking. Bake, covered, for 45 minutes; uncover and bake an additional 15 minutes, or until golden brown and center is set. Remove from oven and recover with foil; allow to set for 10 minutes before cutting into 12 pieces. Place on serving dishes and top with Blueberry Syrup. 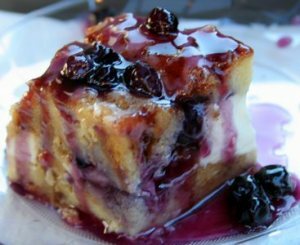 BLUEBERRY SYRUP: Prepare syrup while strata is baking, or this can be made ahead of time and refrigerated until ready to use. Just reheat when ready to use. In a medium saucepan mix sugar and cornstarch together. Add water and bring to a boil, boiling gently for 3 minutes, stirring occasionally, until thickened. Stir in blueberries, reduce heat, and simmer for 8-10 minutes. Stir in butter until melted. Pour over strata.